The Senate narrowly voted Monday to confirm John B. King Jr. as the nation's education secretary. WASHINGTON (AP) — The Senate narrowly voted Monday to confirm John B. King Jr. as the nation's education secretary. The vote was 49-40. 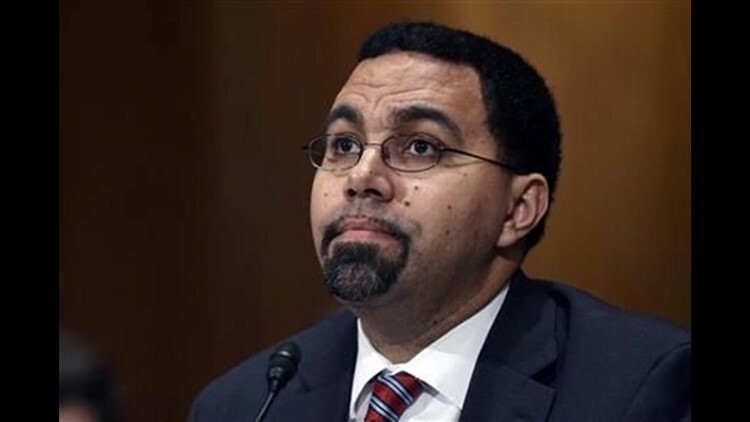 King has served as acting secretary at the Education Department since Arne Duncan stepped down in December. As secretary, King will oversee the department as it puts in place a bipartisan education law passed by Congress and signed by President Barack Obama in December. The measure revamps the widely criticized No Child Left Behind Act and substantially limits the federal government's role in public schools. Obama nominated King last month. After the vote, Obama said King "will continue to lead our efforts to work toward high-quality preschool for all, prepare our kids for college and a career, make college more affordable, and protect Americans from the burdens of student debt." Monday's vote comes as an Associated Press investigation finds little change in the business and marketing practices at a for-profit college that the Education Department helped rescue from near-collapse, despite pledges to ditch the hard-charging sales tactics that have led to complaints for lawmakers and former students. Zenith Education Group had promised to transform Everest University, one of the schools in the for-profit chain of Corinthian Colleges Inc., which filed for bankruptcy protection last year amid fraud allegations. But the AP review has found that significant problems remain, including contentious recruitment tactics and the retention of several senior Corinthian executives in key posts. The department on Monday removed the independent monitor overseeing the business practices of Zenith. The Senate's quick action on the King nomination stands in sharp contrast to united Republican opposition to an eventual Obama Supreme Court nominee. GOP lawmakers in the Senate, led by Majority Leader Mitch McConnell, R-Ky., have said they won't consider Obama's choice to fill the vacancy — no confirmation hearing, no vote, not even meeting with the nominee. They argue that the American voters in November should decide who selects the next justice. At the same time, more than 30 judicial nominees to other courts remain in limbo, with no Senate action imminent. Last month, the Senate confirmed a new Food and Drug Administration commissioner, overwhelmingly backing Dr. Robert Califf for the top post. But other nominees, for Army secretary and head of the Office of Personnel Management, remain on hold, caught up in unrelated political fights. King began his education career as a high school social studies teacher and later was a principal, founded a charter school and served as New York State's education commissioner, overseeing elementary and secondary schools. In New York, he battled with teachers, unions and parents over standardized testing, linking student test scores to teacher evaluations and a rushed implementation of the Common Core academic standards for grades K-12. The state's largest teachers union said upon his departure for Washington that it had "disagreed sharply and publicly with the commissioner on many issues." King grew up in Brooklyn and credits public school teachers with saving his life. His mother had a heart attack and died when he was 8 years old, and his father passed away four years later. He said his teachers helped him feel "safe, nurtured and challenged" during a very turbulent time as a young boy.